A great American poet is gone. Galway Kinnell, whom I met several times, both at Poetry Center San Jose in the 1980s and at the Squaw Valley Community of Writers, where he was lauded as one of the founders, has died. You can read many of his poems at the Poetry Foundation site, and there are numerous videos of him reading his work, as he came to prominence in the age when people first thought to film poets. Here is a short collection of some, I particularly love. From Bill Moyer’s Facebook page, “After Making Love We Hear Footsteps” and with commentary by Garrison Keillor here. Reading “The Bear” in a great black and white film from 1973. This photo is from the SVCW’s website. 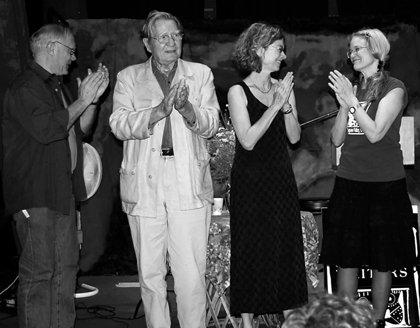 That’s Bob Hass, Galway Kinnell, Brenda Hillman and Sharon Olds, probably at a benefit reading.